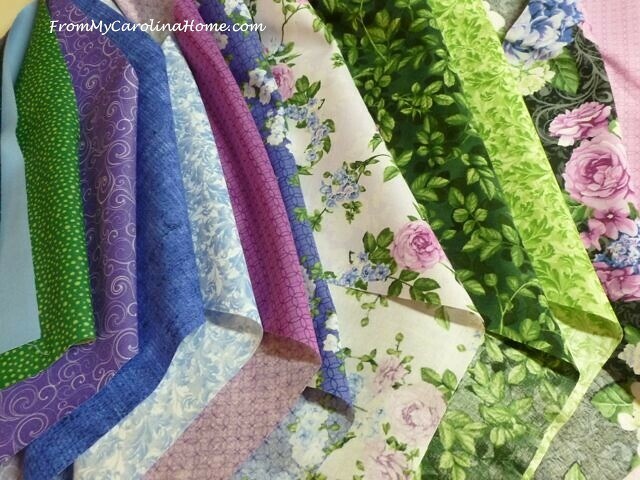 Deciding to start over with the Be My Neighbor Quilt Along, I pulled out some really pretty springtime fabrics. This Beverly Park bundle from Connecting Threads came a couple of months ago specifically to do a lighter springtime quilt. I thought they would do nicely for this quilt too. I pulled more springtime colors and started to figure out the first block again. The block from yesterday will be used in a charity quilt, and I have that one underway too. The light blue Moda marbles for sky is at the top of this picture. I have a darker blue to use as well, so the sky will have some variation. 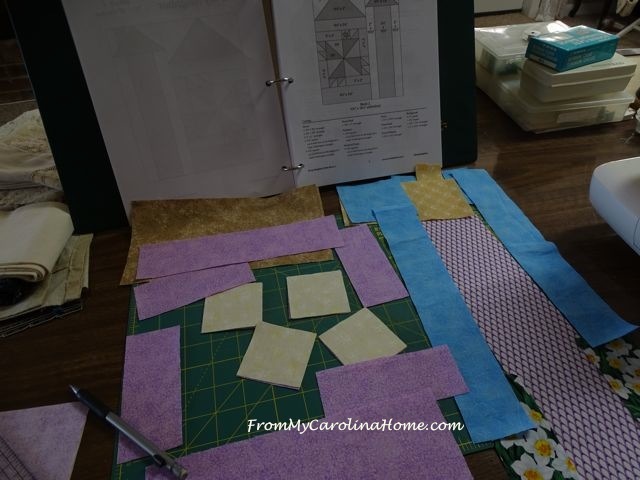 Cutting takes more time than usual because a lot of decisions have to be made as to what colors to place where – house color, window print, roof fabrics, tower print, etc. You can see my notebook in this picture, all the patterns and instructions were printed, hole punched and then put in a binder. This way nothing gets lost. I apologize for these pictures being so dark. I dropped my little camera and broke it. It is toast, so another used one of the exact same model was purchased online so I can use the same accessories as the broken one. I didn’t pay attention to the setting on the good camera, and it was still set for night pictures. Anyway, once again I picked up bits and sewed as much as I could at once. 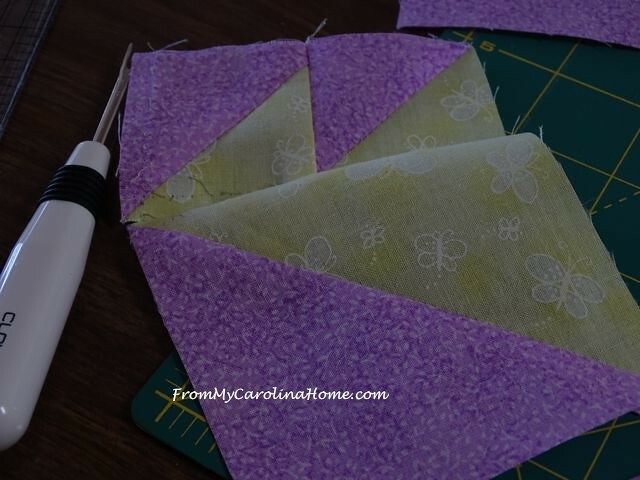 This block didn’t start out well, as I sewed the points together wrong, so frogging the first seams stopped the progress. 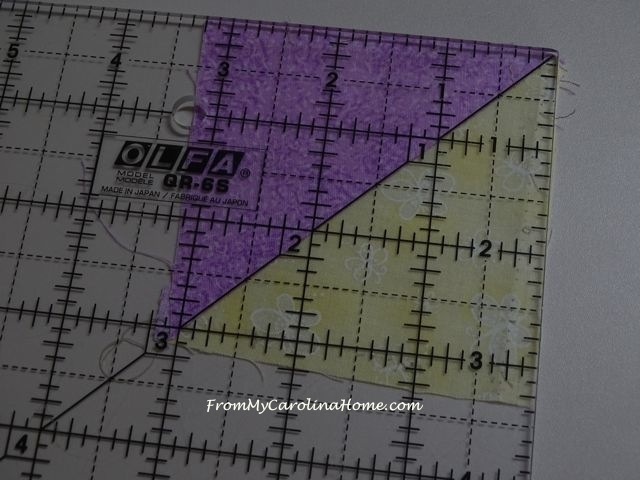 Arrgggghh, this is why I cut extra large and square up HSTs – these should be 3-1/2 inches. 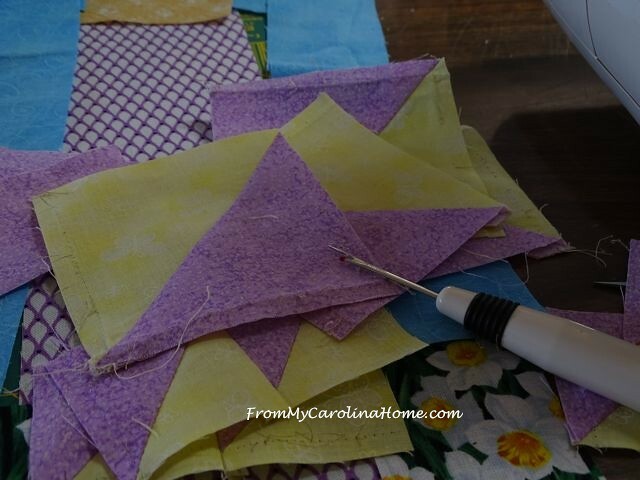 So, I had to start over and remake several of these HSTs. Then I did this. The third mess up with this bloody block! Frogged those out, and finally made progress on some of the construction. But apparently, I still need a lesson on reading the instructions. I messed up the tower roof too, sewing the chimney on sideways, so more frogging was in order. But, eventually, I did get the block done. I added some daffodils to the sides of the tower to set it into a landscape. This block has the alternate blue fabric for the sky. The re-made Block One went a bit faster. I used a flower with leaves fabric on either side of the now flowering tree to set it into a landscape. The tree has tiny oranges and leaves now. The actual block is lighter than this picture makes it appear. Here are the first two blocks done. I’ll be working on the third block to get it done before the next meeting. It has a bunch of really tiny pieces, and also some applique. I don’t do well with applique, so I’ll be getting out a couple of books to try to do better this time. I just need more practice. Plus it will give me some handwork to do, which I do enjoy. 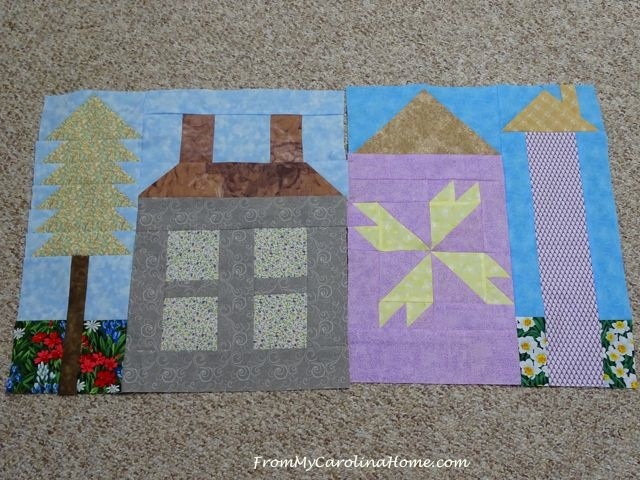 You can still get the downloads for the 12 house blocks on Bear Creek Quilting Moda Be My Neighbor, but I am not sure how long they will be there. I’ll get to block 3 next week, and then I plan to do one or two a month after that. There are sixteen blocks total, so we need a couple of months to have two. 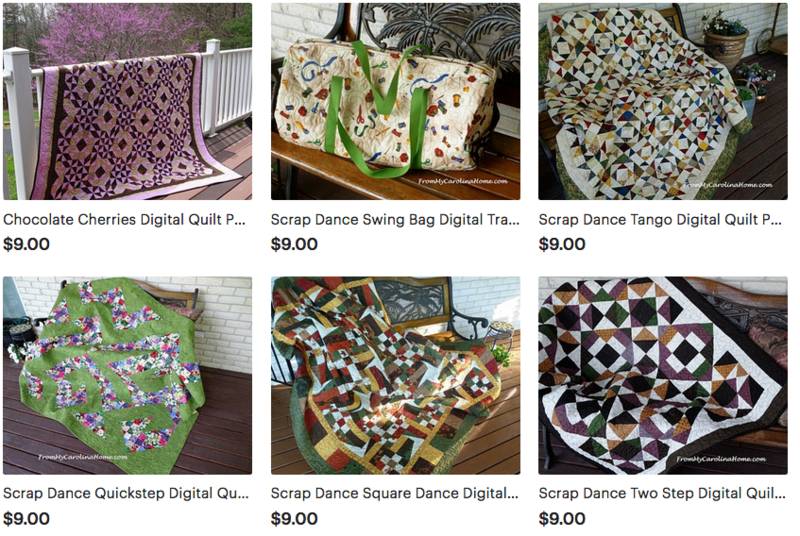 I will likely publish these on the first Wednesday of the month, as that is the monthly time for the local quilt shop’s meeting. Do you like the new color choices? Do you want to quilt along? Looking good! Haven’t worked on any more of this as too busy working on ‘Glacier Star’. 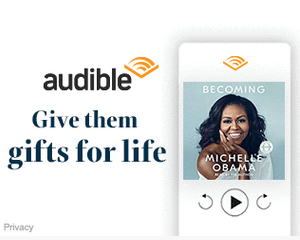 But, I already have the first four blocks done, so I’m good. Hope all well with you. 2nd cataract surgery moved to this Thursday, so should see you on 3/1, unless conflict with eye Dr. appt. Don’t know the time of that one yet. Have a great day! I really like the changes in material from yesterday, so much more outstanding. Thanks for sharing. Your blocks turned out beautiful! so often I have to make my blocks larger than they should be also and then square up – I have a quarter in foot on my machine and it still happens! Like your color choices and your blocks. I think I will try to do the blocks. Thanks for sharing your blocks, and your mistakes. I enjoy reading your blog. 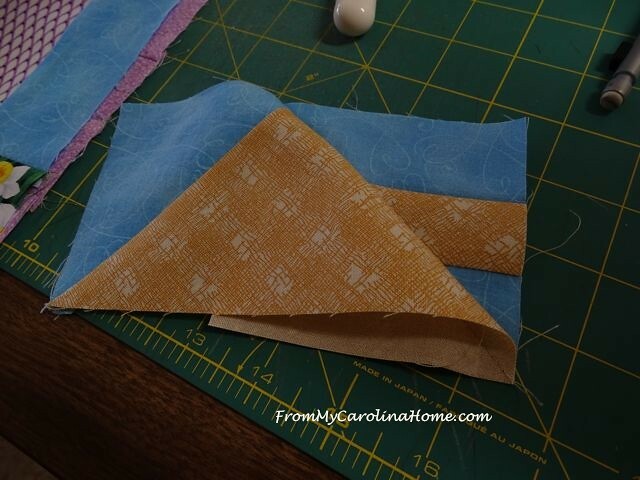 I also like the new fabrics better – looking good – looks like a fun one, scraps are my favorite! My group made the last Scrap Dances, most went to charity, ’cause that’s what we do mostly. I have a question about your patterns, tho. I know you sell them on Craftsy once the Mystery is over. 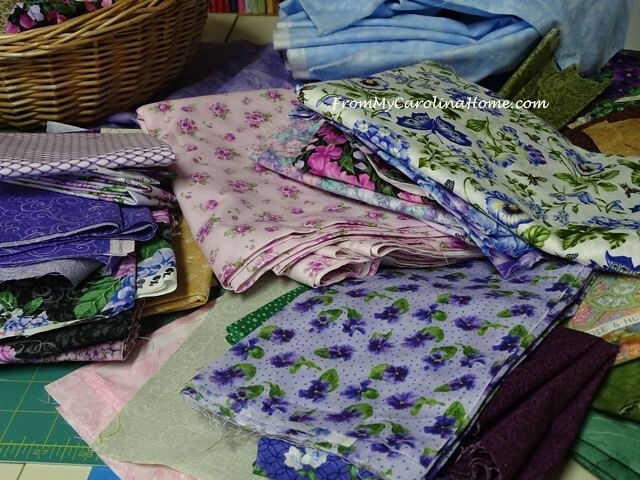 But we attend a Workskhop in this area every year at this time, and my group has been asked to do the Mystery quilt for next year’s workshop, and I wonder if you have any special arrangements to sell the patterns to a group – usually about 100 in the group. Or do I just direct them to your website and let them get their own pattern? Not all the people use computers, so if you have a special offer for groups, it would be helpful!! Thanks so much. Looking forward for the next step, know these patterns are a lot of work for you, and it is appreciated!! Love the new, bright fabrics! I just downloaded all 16 patterns so that when I have a chance I can start working on them……lots going on now in personal life so I’ll have to wait. Bless your heart! You really had a time of it with the second block, didn’t you? I love the close up of your fabric choices. I feel as though I’m sitting right next to you as you sew and assemble these. I hope the next challenge comes easy to you. I wouldn’t have thought to use flowered fabric for the grass, and it really makes your blocks special! Love what you’re doing with these blocks. I would have started out the same way you did, and been underwhelmed by the result too. You really have taken them up a notch. I grieve for your little camera. I hope mine doesn’t get any dropping ideas. I like the fabrics you have decided to use on these. I find good company in the fact she share your ups and downs with the blocks. Though I’m tempted to join along…your tango is the perfect speed for me right now. Your blocks are adorable and I especially like the added flower garden. Wishing you a great monday! 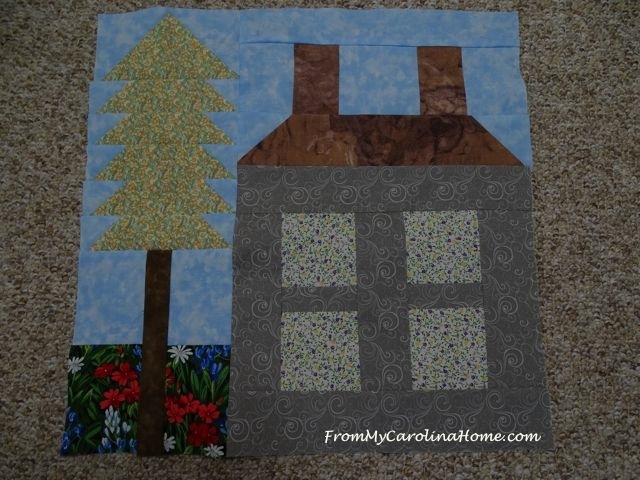 I like the new house and garden under the tree, lovely fabrics. 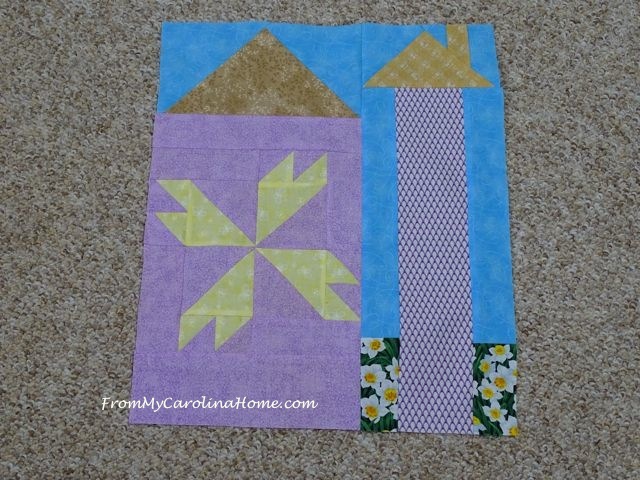 This is going to be wonderful when all done, will you add sashing to each block? Hello Carole! Both of your blocks look great! I do like the new Spring fabrics you have chosen for this Quilt Along. 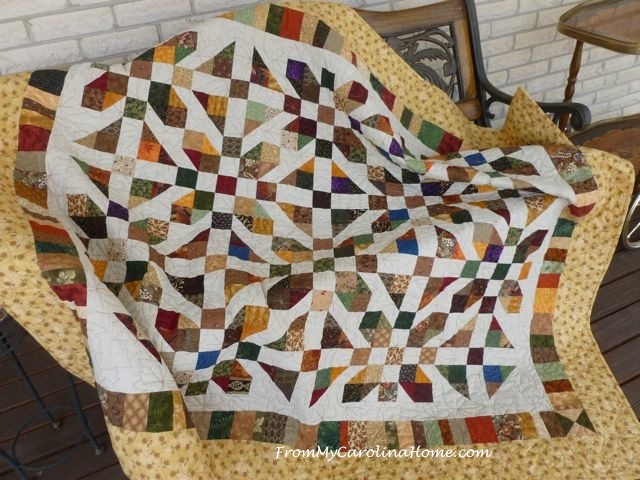 I decided not to join this Quilt Along and just enjoy your posts for this quilt. I have far to many Quilts to finish as it is. 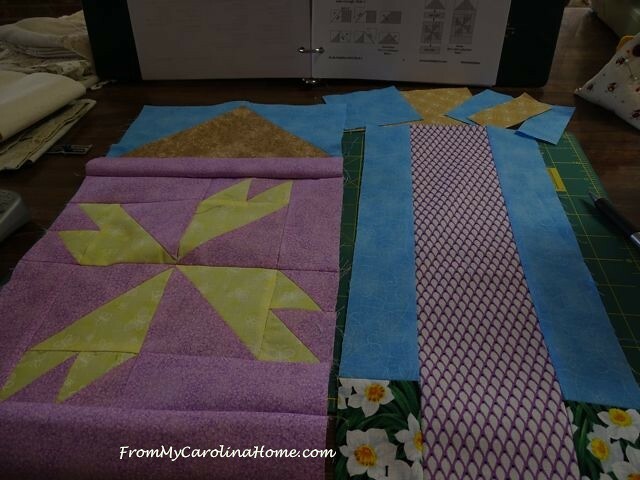 Especially, the 2nd Step of the Two Step Quilt Along. LOL. Which I love the name of by the way. I also need to sit down and start writing posts on my blog. We will not talk about house work! So while I am doing all of the items just mentioned, what are you going to be doing today? Always seems if I make one mistake on a project, it’ll be the first of many. Yes, I really like the new fabric choices. 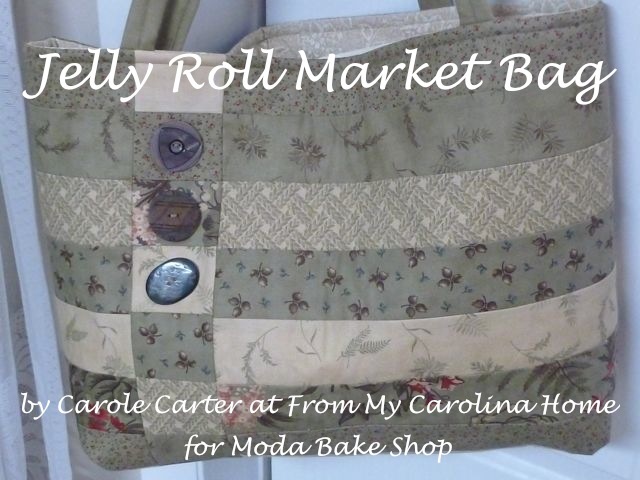 This is very pretty, Carole. I like the houses. I hope you had a good day working on this. Pulling out stitches is part of the process these days. ha! Hi there! 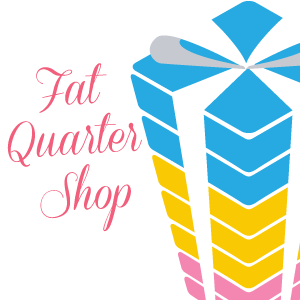 Your post made me feel better about my own recent quilty decisions! I, too, have decided to start a project over! 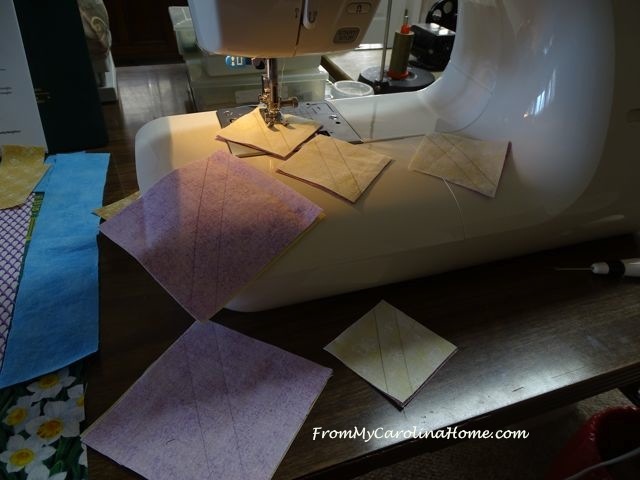 And I made the same mistakes you did on my one BMN quilt blocks! Do you mind if I borrow your idea of using floral prints for the “ground”? Nice idea! Thank you for shairng! 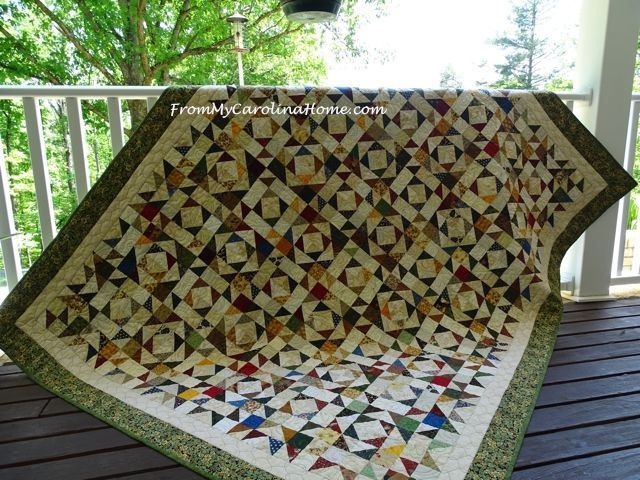 Glad I found you on Cooking Up Quilts! Oh whoever gets your block 1 in a quilt will still enjoy having it. I do love your revised fabric choices. 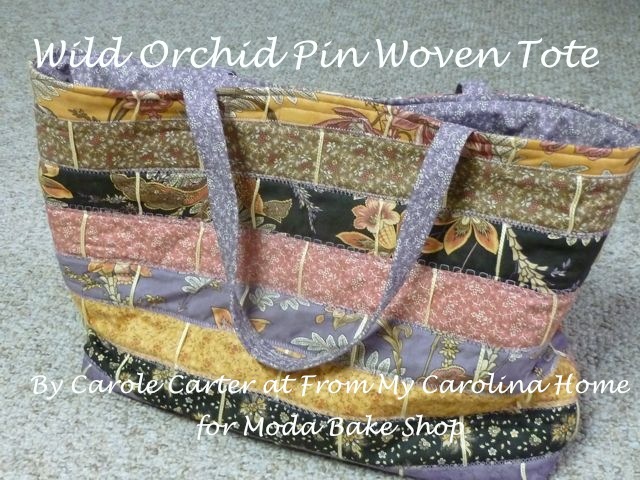 I took a machine appliqué class with Pat Sloan and enjoy the method she uses. Her book “Teach me to Applique” is easy to follow. I had to laugh when you showed all of your re-dos for your blocks! We are not alone in that problem! I love your beautiful spring-y fabric. It looks perfect for this project.